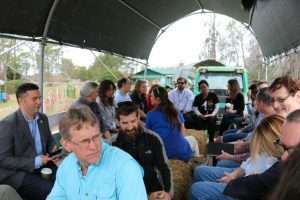 Thanks to all our partners who helped make the first ever Central Florida Food Systems Tour on February 2nd, 2018 a huge success! The tour focused on the entire food system from production to processing, including marketing, distribution, accessibility and food waste. Visiting Long & Scott Farms, Edible Education Experience, East End Market, Fleet Farming and Audubon Park Covenant Church showcased the passion and innovation of those working in this industry and provided examples of what can and does work…as well as some of the hurdles they face. Lunch was organized by Seed2Source and provided the attendees with a real taste for our local foods! We had eats from Sonny’s BBQ and Yaupon Bros. American Tea along with hydroponic lettuce grown by inmates of the Seminole County jail and organic strawberries from Long & Scott Farms. With a range of speakers from UF/IFAS, City of Orlando – GreenWorks, Good Food Central Florida, Seed2Sourse, Long & Scott Farms and A&S Horticulture as well as many other local experts, the day was both interesting and informative. And with attendees including Congressman Darren Soto, representatives from both Senator Nelson’s and Senator Rubio’s offices, Commissioners from Orange & Seminole counties and local municipalities, there was a full complement of those with the ability and influence to affect change and break down barriers. As a result of the information shared on the tour, the City of Orlando has made changes to the verbiage on their proposed urban agriculture ordinance. Connecting the various food systems pieces as well as the people that work, educate and make policies in this industry can help foster new ideas, processes and solutions to help get local foods where they belong…at the markets, in the schools and on the tables!